Our recent post on battered women syndrome engendered some discussion about when violence is appropriate. I think it's legitimate in self-defense. Unfortunately some people have a rather elastic concept of self-defense and would extend it to such actions as shooting someone while he's shaving or burning his bed while he's asleep. Self-defense is legitimate while the aggression is taking place and when the force used is proportional to the threat. I can't shoot someone because they stepped on my blue suede shoes. But some citizens, either from their basic nature or bitter experience, have decided that a deliberately disproportionate self-defense response is the best way to discourage further attacks. 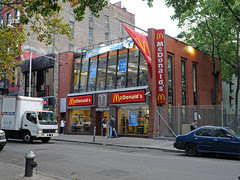 Two very stupid, drunk and violent women recently discovered that the hard way in a Manhattan McDonald's. Both men AND women need to avoid starting fights.You don't know what other people consider to be a "proportional" response to your provocation. If I were moronic enough to walk up to Ray Lewis, Chuck Liddell or Bernard Hopkins, curse them out and slap them in the face, I would expect that there would be consequences and repercussions. Cause, meet effect. I think some women have learned the wrong message from the modern female empowerment environment we live in. Like those old Dave Chappelle skits, you can decide to "keep it real". But every now and then you're gonna run into someone who REALLY doesn't give a f***. And this was so stupid. Cashiers are often told to verify large denomination bills. It's not something worth starting a damn fight over. 1) If two men had cursed a cashier out, slapped her and jumped over the counter with bad intentions before catching a beatdown from the woman, would this story be described as horrific or humorous? Do the women have a legal case against McDonald's? 2) Do you think the man's response was disproportionate? Would you accept an argument from him that he was acting to protect himself or team members? Or do you now have sympathy for the women? 3) Was it news to you that McDonald's is hiring violent ex-cons? 4) Bonus question: What causes the sort of brainlessness shown in this video?